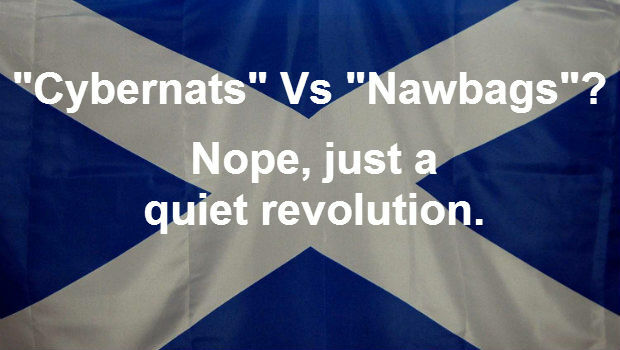 “Cybernats” Vs “Nawbags”? – A “Cybernat” (a term coined by Lord George Foulkes) is a term for an abusive online activist for a Yes vote, a “Nawbag” is the same but for a No vote. If the media are to be believed, “online abuse” is a big problem in the referendum campaign. We have examined this premise and found the reality to be surprising and different. Sections of the Scottish media, both broadcast and print, are making a lot of noise about “online abuse” in the independence referendum campaign. We don’t deny that this exists, just look at the recent online death threats against the First Minister for concrete examples, but there comes a point where we have to step back and look beyond the sensationalist headlines. Yes, some people disagreed with JK Rowling’s choice to back a No vote in the referendum but the vast majority of people who disagreed did so in a civil, even humorous, manner. Not that you would know that from the screaming editorials and tabloid front pages following it. Bias in relation to the referendum exists thrives in the Scottish media and it is mostly fervent in it’s desire to maintain the status quo. There is a level of ignorance there, whether feigned or actual about the undercurrents eddying around our country at the moment. You will read the odd article about the “rise of the town hall meeting” or words to that effect but that is only the very tip of a much larger iceberg, merely the highest note in a growing chorus of discontent with the way things are going within the UK. Contrary to what the “mainstream media” would have you believe, this referendum is about so much more than one man or one political party. We have seen engagement from ordinary people of all parties and none, with a new and unpredictable voice on the scene, that of the previous non-voters. There is an awakening and an engagement with the political process that is unprecedented in Scottish history. People are becoming interested and are engaging with the debate because for decades they have been presented with the same old stale choices by Westminster politicians and now they see that all the choices are on the table, not just the ones the political establishment wants to offer them. The media often try to demonise these new voices in the debate. They can be loud, brash and largely free of the media-management techniques of the politico-media class that journalists are more used to dealing with. They question journalists directly and at times uncomfortably via social media, confronting, questioning and exposing their perceived bias head-on, in a way that the professional political class has traditionally shied away from for fear of a backlash. There would not have been a demonstration against BBC bias five years ago that attracted upwards of 1,000 people, with many more refusing to pay their TV license to subsidise what they see as biased referendum coverage. Examining the claims of “online abuse” in detail actually reveals that most of the time no abuse happened, it was just a difference of opinion, devoid of insults. Fife News Online in no way condones actual online abuse and condemns it absolutely when it happens but it is relatively rare in Scottish politics and certainly not at a higher level than on any other part of the internet. To some extent it is just a problem of the online age, anonymity allows a level of freedom to say things some people would shy away from if they had to put their name to it. The rise of social media poses a real problem for the “mainstream media” because it challenges both their control and their authority. At one time they could say almost anything and be believed but that time has passed. With the advent of the internet and the speed of sharing information, articles can be dissected and debunked by bloggers and online activists minutes after appearing online. To a certain extent, the constant media refrain of “Cybernats, online abuse!” is a defence mechanism and an attempt to de-legitimise sometimes well-deserved criticism in the eyes of the wider public. How much this is being paid heed to remains to be seen. It feels a bit like the media are running to teacher because someone dared to stand up to them in the playground. What we are seeing is a revolution, a quiet one but no less revolutionary for all that. It is a society waking up to the power it holds within it’s hands, to shape the country in it’s own image, regardless of the outmoded politics of much of the political class. Whether this extraordinary energy and engagement can be maintained beyond 18 September rests largely on the result but there is a growing and previously untapped vote which transcends normal political definition that is coalescing around the need for change. Those on both sides of the debate would do well to pay heed to their aspirations.